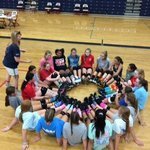 Tryouts for 2019-2020 Volleyball season will be the week of May 13th - 17th. Days and Times will be announced starting May 1, 2019. Please make sure you have an updated physical on file before tryouts.